Before we get started on my Shantae and the Pirate's Curse review, I want to state that as someone with a degree in art, I really like certain looks to games. If you don't want to hear me gush about the visuals in this game, skip past the next paragraph. Still here? Ok. Wow, I just love the visuals here. The character portraits are awesome looking, and not just for the scantily clad girls. They are really detailed and super smooth. The in-game models are really nice sprite art, and the animations are great as well. One thing I've noticed with WayForward is the amazing animations they put into games. The music is also really, really good. Shantae even speaks a select few lines, which is pretty cool. It's mostly character's names, but it does add to the game. I don't think I'd want every line spoken, so this is a good middle ground. Shantae also controls really well, provided you are using the d-pad. I tried using the analog stick, but it didn't feel nearly as good or as precise as the d-pad. It also felt more precise than Risky's Revenge did, but I'm not sure if there was some backend change, or just the different controller did something. Shantae's different moves are mapped out pretty well on the controller, which allows you to use her various power-ups. The only minor issue I had was when opening the map/item screen you had to back out by hitting the button again instead of the B Button for canceling. Oh, and I'd love to turn off the vibration feature. Maybe in an update or future title? Pirate's Curse is fun, but there were several parts of the game that were difficult. As you progress, enemies hit harder and harder, and you need to get a lot of the health upgrades to just stay afloat. I'd prefer it if it wasn't so strict, but I think it's mostly appealing to the "loves hard games" crowd. Or they want to encourage you to learn all the patterns and just "don't get hit" (thanks, Tyler). The boss fights were challenging the first few times, but end up being not that bad after you figure them out. Except for Dagron...I hate that fight. It's oddly harder than the final boss! I think the platforming is actually harder than the bosses. There are many parts where you have to move quickly and precisely, avoiding enemies and trying to skillfully land on small platforms. Many of these sections become easier once you have the pirate upgrades. However, the final dungeon is really hard. Yes, as the final dungeon it should be harder, but they want such precision just to get through it that I found it very frustrating. They are long rooms that you have to do in one go, and you need to expertly use each travel method. If you are persistent, you will eventually get through it, but it can lose all fun really fast. Silly or not, I love the design of the skull bra. If you have played the previous game, or most other metroidvania-type games, the map layout should look familiar. However, this game is broken into several smaller maps, for each island, area and dungeon, instead of one giant map. A few places of interest are marked on the map, but not items. Yes, there would be some purists that don't want any hints, but there are those of us that can't memorize the whole map and would like a reminder. The map works well, but I would really like a way to scroll through the different maps of a given island. As it stands, you can only see the map of the current area, and some maps are broken into much small pieces that aren't always so helpful. Not really a deal breaker, but a nice thing that I hope makes it into a sequel. Thankfully, Pirate's Curse is longer than Risky's Revenge. The game took me around 9 hours to get 100% in my first run. The game is also meant to be speed run, as there is even an achievement for it. Beating the game once unlocks "pirate mode", where you start with all the pirate power-ups. Besides being really cool and fun, this makes speed running much easier. Heck, I might even try, and I don't even like doing speed runs. There are also multiple achievements in the game that are hard, like one per boss by beating them without getting hit. I can see this for a few of them, but not Dagron. I really, really...really dislike fighting him (if you couldn't tell from earlier). It was hard enough for me to beat him, let alone not getting hit. Ugh, bad memories there. Anyway, as a nice reward for getting the achievements, each one is a picture of a character in the game. So if you love the artwork in the game like I do, it makes for some great pictures to use as your background! 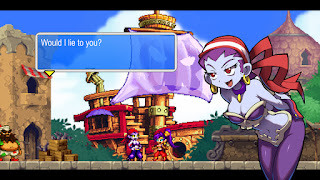 Even though there are frustrating parts, I liked playing Shantae and the Pirate's Curse. The controls are tight and responsive, and it plays really well. The music and art are my favorite part of the whole thing. It's longer than the previous game, and an easy recommendation to any metroidvania fans. The unlockable mode, speedrun possibilities and achievement art gives some good reasons to go through it multiple times. An overall solid title that is worth playing.